Recently had brunch at Gastro 1/6, a small cafe at the RMA Institute deep in Sukhumvit Soi 22. When I ordered the following, they asked if I wanted a scoop of ice cream with it. I guess I thought of French toast with fresh fruit as more of a breakfast dish than a dessert, but when the fruit is this sweet and it is drizzled with maple syrup, I guess it isn’t that far from a dessert, is it? This entry was posted in Uncategorized and tagged breakfast, Dining, food, Gastro16 by christao408. Bookmark the permalink. What? Ice cream is no breakfast?? Shocking news! Interesting collection of fruits. Don’t know about ice cream but maybe some heavy cream – well I think I would prefer it as is for breakfast and dessert. looks sooooooo good….what’s the white stuff with black dots,though?I wanna make this for myself ! @oxyGENE_08 – So true, so true!! Hope it was as good as it looks. This looks so yummy:) Hubby loves waffles with small chuckles of water melon (in season) on top, and light whipping cream on top of that. I know the white one is dragon fruit, but is the red? Looking good Chris. As ALWAYS. Looks fantastic. What is the white stuff? pineapple, durian, pear or apple, kiwi, and a couple of kinds of cactus fruit. right? With hot coffee, it’s a dessert. Breakfast sometimes means breaking your fast. So technically when it has been a while before eating you are getting a meal that is the first in a long while.Joe San in Cantonese means good morning. A morning meal is what most people mean by breakfast. Even a dessert being served in the morning will technically be breakfast.If you served ice cream that would push your meal into the dessert category. However some folks would call it a celebration if ice cream and cake is served. Since you didn’t order ice cream even though it was offered you wanted to push what looks like a dessert into the breakfast category.Another interesting detour is if someone served tea at the same time. Then for the British they would push this meal into the tea time category. So many cultures and so many inferences. Ah. Tasty! I bet that you could have made it at home. It does look inviting but ice cream on toast – ick! think of donuts, cinnamon buns, muffins, scones, pancakes, etc. aren’t they all pretty much desserts made to be taken as breakfast? the only proper breakfast that can’t be made into dessert is cereal. well, then again, there’s granola with yogurt. that’s cereal on top of fermented milk. often topped with honey or jam. hmm… so cereal CAN be made into a dessert after all. ok, i’ll shut up now. Dear God, that looks to-die-for. Dragonfruit is a cactus fruit. In Spanish it’s Pitaya or Pitahaya but I couldn’t remember the name until I looked it up just now. Delicious stuff. @Roadkill_Spatula – Ah, I learn something new every day. Thank you! I never did understand why people load up French toast with ice cream, whip cream and stuff. @brooklyn2028 – I’ll know where to bring you when you visit, then. @ElusiveWords – Yeah, it seems excessive, doesn’t it? 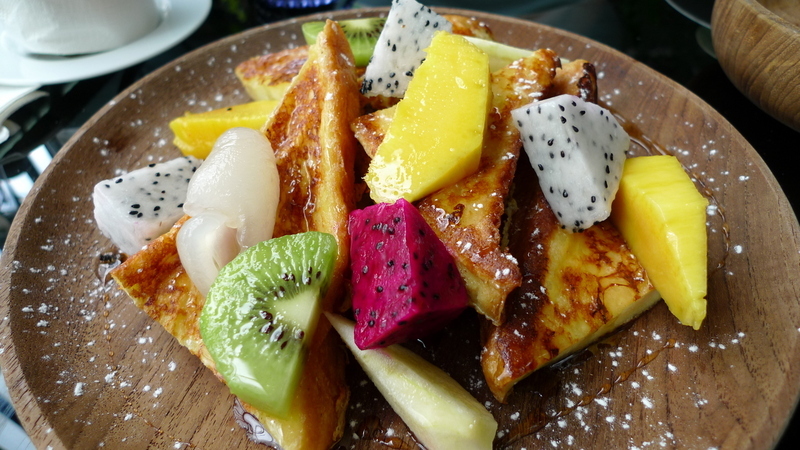 @grannykaren – We’ll order so sugar, no syrup for you – just loads of fresh fruit. @christao408 – oatmeal porridge for breakfast? i’d prefer oatmeal in granola instead. or rice porridge. i can never get used to slimy thick throat drying consistency of oatmeal porridge. @rudyhou – Actually, I do make homemade granola, too, although Tawn is the main eater of it. I prefer my oatmeal. With dried fruit added to it, and the right amount of water, I don’t let it get slimy and thick. @rudyhou – No doubt you will and we’ll have a chance Friday to see.